Why pay for Office when it's free in the cloud? Google has recently added an entirely new type of document to their Office Cloud offerings (i.e., Google Docs). In addition to cloud software for wordprocessing, spreadsheets, and presentation (Powerpoint is the most well-know presentation software), Google has added drawing to its Google Docs suite. 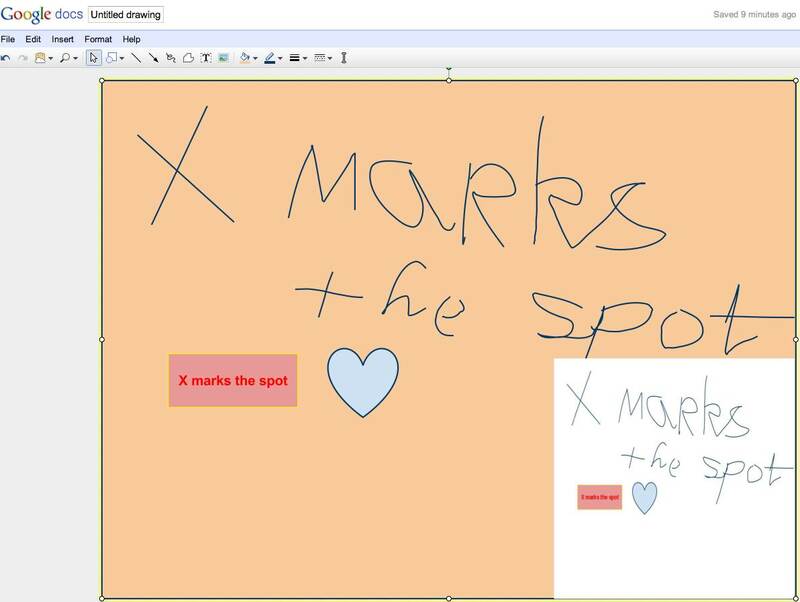 The Google Drawing software looks very much like a simple desktop drawing application with tools for selecting objects in the drawing, inserting shapes, adding lines (with optional arrowheads), a freeform drawing tool, adding polygon shapes, text boxes, and filling an area with “paint”. You can change the color of the bounding box (and the thickness of its lines), and the text color. You can rotate an object. You also have five useful menus will additional functions. Drawings, besides being a native Google Docs file format, can also be saved and downloaded as jpeg, PNG, PDF, and SVG files. Note the third tool from the left in the toolbar. It is Google’s “web clipboard”. Drawings (or parts of drawings) copied to the web clipboard are saved in the cloud instead of on your computer. These drawings are retained in the cloud and can subsequently be pasted into other types of Google Docs (Wordprocessing, Spreadsheets, and Presentations). Items copied to the web clipboard stay in the cloud for a month, so you can choose which of several copied items to paste into a doc. The web clipboard can also be used to copy a selection of cells in a spreadsheet and paste them into a different kind of document. This entry was posted in Cloud Computing, Drawings, Presentation, Spreadsheets, Wordprocessing and tagged Drawing, Google Docs. Bookmark the permalink. Great advice and tips, Thanks so much! I had lost your track since we don’t have our Pi meetings any longer. Fortunately, I just found a bookmark with your blogs. Thank you very much for all you did, it is very helpful. I just bought an iPad and I struggle with Apple’s i cloud. I also have an iPad and I have Mac computers. But so far I’m not impressed with the Apple iCloud. It is too specific to Apple products and so I can’t use iCloud to share files with others who might not have Apple hardware. Google has recently introduced their Google Drive. I’m very impressed with it and hope to do a blog post on the subject soon.